Everybody’s doing it. Sound familiar? It should. It’s brain science. People tend to do what other people are doing. Psychologists call this conformity, herd behavior, or the bandwagon effect. Marketers call it social proof. The goal is to increase conversions by giving evidence that you are accepted by others. Visitors, influencers, subscribers, and buyers all trust you. This kind of “informational social influence” is a simple and powerful way to improve the initial value judgement of your landing pages, your site and your company. Social proof makes any decision other than using your company seem outside the norm. There are many web design tips based on brain science, but these seven are specifically designed to get your audience onto your bandwagon. Here is how to use social proof to improve your conversion rates. When you say it, it’s marketing. When your customer says it, it’s social proof. This is why testimonials are so powerful. The substance is better; it’s an objective, third-party perspective. The style is also better; it’s more authentic, less polished. Like all types of social proof, testimonials and reviews are great supportive content. Sprinkle them throughout the site. Ideally, add one to each page aligning the social proof with the product or service. 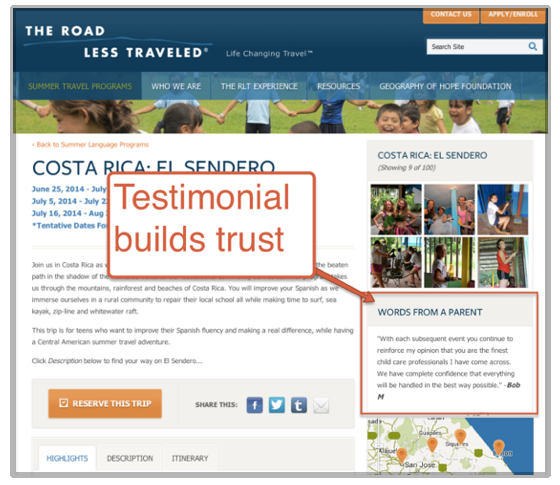 The example above showcases a well-placed testimonial from an actual parent, building trust on a teen travel program website. Beyond the testimonial lies the expert and celebrity endorsement. The more relevant and influential the endorser, the more powerful the social proof. If your business has ever received a compliment from a well-know person who is respected by your audience, go find it, and add it to your home page. 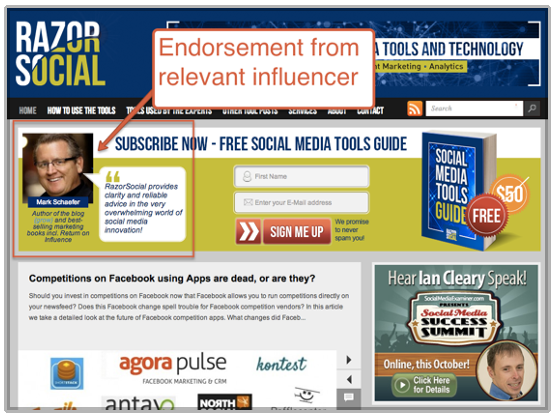 To make this more effective, add a picture of the person who gave the endorsement. Research shows that pictures (along with text) increase the credibility of the statement. This actually works for any testimonial. Signing up for a newsletter takes a lot of trust, so you need to build up confidence around your signup form. Of course, tell the visitor about the content and frequency (monthly advice for bounty hunters, weekly nuclear reactor safety tips), but also show some social proof. If you have a big list, tell visitors how many people have already subscribed (join the 5,000 people who receive…). If you don’t yet have a lot of subscribers, use a testimonial quote from someone who got value from your blog and newsletter. You might find a few of these in your comments. This really, really works. 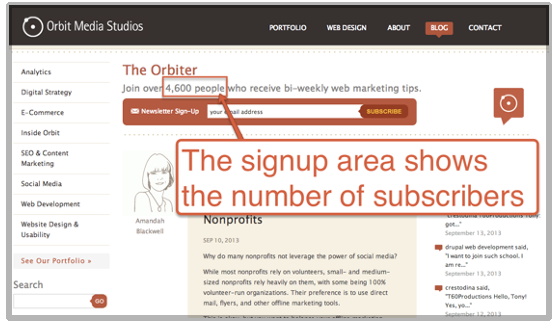 On the Orbit blog, improving the email signup form increased the newsletter subscriber conversion rate by 1400%. It’s easy to add these to your blog to show the number of tweets, likes, and shares for every post. Each of those shares is a vote of confidence for that content. The first two are examples of social proof. If the widget shows the face of a follower that the visitor recognizes, it’s far more compelling. Suddenly, it’s about conforming to the behavior of someone they know! Do not use these widgets (or even social media icons) if you are not active within that social network. Why send visitors to a dead social account? You’re just inviting them to leave your site. People don’t get onboard empty bandwagons. The Moz Blog uses a social widget to show off their huge following to new visitors. If you’ve ever gotten covered by the media, you have a chance to improve your credibility and conversion rate. Right there on the homepage, show logos of news media and websites that have mentioned you. The Edo Interactive home page shows both current and past press mentions. 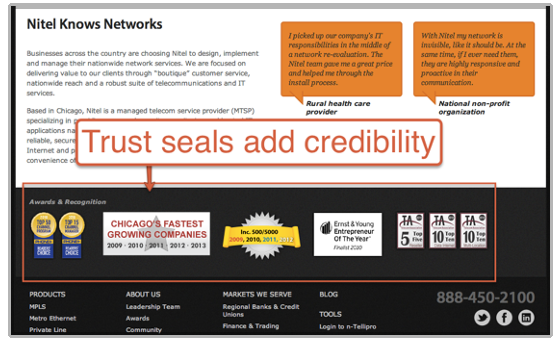 By adding a trust box filled with awards to the footer, Nitel builds credibility on every page. Also notice the testimonials, which name the industry, but not the specific client.